Editor’s note: As of May 2015, Google’s webmaster tools suite is called Google Search Console. If you go to the Search Traffic navigation and click on “Manual Actions” you’ll see a listing of site-wide matches (spam found across a whole domain) and partial matches (spam flagged on “specific pages, sections or links”) of your site. Manual Actions reported in Google Webmaster Tools for a Bruce Clay, Inc. client. The domain is reported next to the listed action and is obscured in this screenshot by a black bar. Click to enlarge. A “Request a Review” button appears below the spam listing in the new Google WMT Manual Actions report if the user has administrative access. Click to enlarge. There’s a new page on Manual Actions in Google Webmaster Support, and the Google Webmaster Help channel on YouTube was updated with 7 videos of Matt Cutts explaining the types of spam now reported and how to fix them. Click on the listing below to go to the video on YouTube. I think that it’s being rolled out to all accounts so if you don’t see yours now, it may show up in the next couple weeks, Lesniks. All Google WMT accounts should see?? All Google WMT accounts should see a Manual Action tab. If the account is new in GWT, then it might take some time for Manual Actions to show up. 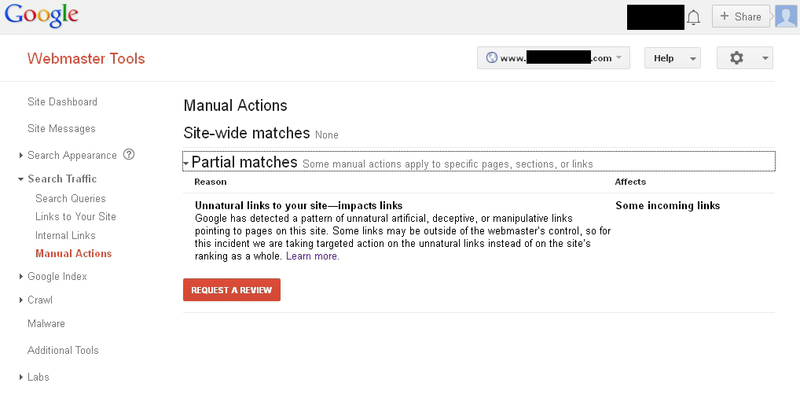 Google did take the Manual Action down temporarily, but it should be back up. Never knew that i should be aware of the possible penalty for web violations. Thanks for sharing! Will visit your blog more often. Is this tool implemented on all Google Webmaster accounts, or is it coming in phases? If you don’t have this section I’m curious if it means there is just no issue, or it just hasn’t been rolled out universally yet?